Ready to have some fun!? This lab requires students to convert crazy measurements into sensible measurements. If they do it correctly, they have a recipe for fudge! Let them test their skill by making the fudge according to their answers. Taste the sweetness of success!! This product comes in WORD format and is easily edited. 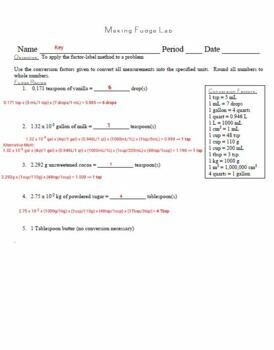 It includes teacher instructions, lab procedures, student handout, and answer key.